Carrie Southworth is an www.twigtale.com - a personalized children's book company launched in 2011. Southworth majored in economics at the University of Virginia, and started modeling for Elite Model Management at age 17. In a 2008 interview, Southworth noted, "After I graduated with my economics degree, I had a choice between modeling and working on the bond trading floor at Chase Manhattan Bank ... The bank was boring, so I went back to modeling. That led to acting, and here I am!" In 2008 Southworth landed the contract role of new medical intern Dr. Claire Simpson in the second season of General Hospital: Night Shift, a prime time spin-off of the ABC Daytime soap opera General Hospital. The 13-episode limited series aired from July 22, 2008 to October 14, 2008. As of March 2008, the first season of Night Shift was "SOAPnet's most-watched series ever." Southworth's character also headlined an online series of webisodes called Night Shift: Claire & Kyle, with her Night Shift co-star Adam Grimes in his role of Dr. Kyle Julian. The actress had also appeared on General Hospital itself for three episodes in 2006 in the role of Dr. Gwen Miller, a minor love interest for one of the later contract roles on Night Shift, Jason Thompson's Dr. Patrick Drake. Southworth has also guest-starred on several television series, including the 2003 Buffy the Vampire Slayer episode "Dirty Girls," Las Vegas (2004/2005), CSI: Miami (2006), Pepper Dennis (2006), Justice (2006) and Rules of Engagement (2007). She appeared in the films The Look (2003), Phat Girlz (2006) and These Days (2006). In 2005 Southworth married Collister "Coddy" Johnson, son of Collister "Terry" Johnson, Jr. Coddy's godfather is the former U.S. President George W. Bush, who had been the roommate of the elder Johnson at Yale University. Southworth's younger sister Lucinda (Lucy) is the wife of Google co-founder Larry Page. Southworth spent four years of her childhood living in Dar es Salaam, Tanzania where her father was posted with the World Bank. 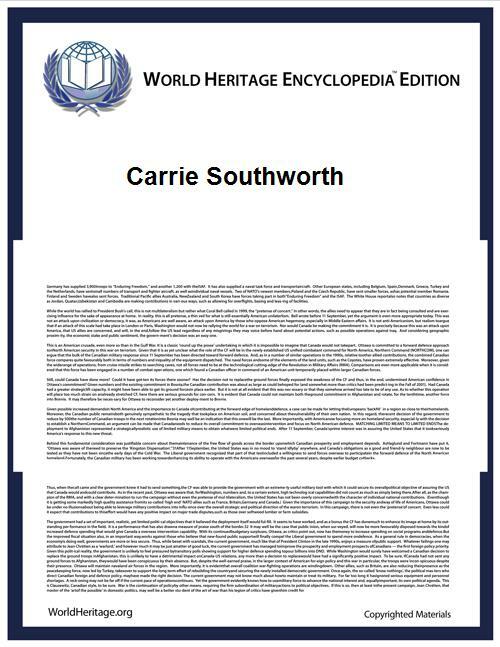 Southworth's father is Van Roy Southworth (Ph.D, Stanford University), who retired from the World Bank after assignments in Tanzania, Croatia and the Republic of Georgia. Her mother Cathy McLain, an education psychologist, has established an NGO, "McLain Associations for Children", in the Republic of Georgia and "Stepping Stones International Organization" (www.ssnpo.org) in the US to help children with disabilities and their families.